Bollywood legend and world famous actress Hema Malini was conferred the Akkineni National Award today at a glittering ceremony held at N Convention center Hyderabad. The Union Minister of Railways Shri Dinesh Trivedi was the chief guest at the venue. The event was attended by many famous personalities from the movie industry apart from the Akkineni Family. 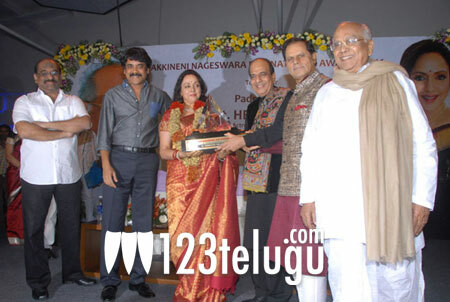 Hema Malini “It is my great honour and privilege to receive this award instituted by the Legend of Telugu Cineman,Shri Akkineni Nageswara Rao. It is wonderful to see the entire family involved in the activities of the industry and in other social activities. Subba Rami Reddy has always been a great supporter of art. I am known to him since many years. He inspires me a lot. I have been in the industry for the last few decades. What is important is the active involvement of the artistes in the industry. My mother moulded me and guided me to greatness. I thank all those people who had faith in me in my early days. I thank my fans for giving me so much love. I am accepting this award with so much happiness”. Dinesh Trivedi” I am honoured to felicitate Hema Malini. When I used to watch her on screen in my youth, I never imagined that I would share the same dias with her to felicitate her. She is a timeless actress with incredible talent. What a Journey it has been. From Johny Mera Naam to Baghban, she has been an incredible actress. However, I must say that there is no award bigger than Shri Nageswara Rao and Hema Malini themselves.With the talent we have, our film industries can do better than even Hollywood. Have belief and have faith”.